So I was browsing yesterday and I found that VG247 is doing keys giveaway for the aforementioned game. 3. Add your email so that they can send you your key. Keys are redeemable at Steam. They say there are 500,000 keys but who knows how much it can last before they ran dry of them, so get yours quickly. PS: I will be adding other games giveaway posts to this thread as soon as the new giveaway pops up or I find it. Proof: - Game added to my account. [nopoints]Ok! Why does this stupid site always wants me to login through Facebook? Looks like someone is getting paid to collect nice big data for Facebook anytime they want and need more than they already have. Useless giveaways. Indiegala and DLH giveaways are much better as they do not require crap like Facebook, Google+ or Twitter to get a key. Every single time I try this giveaway site and sites that use Bundlestar to give keys away want a Facebook login. They don't get that there are people who aren't using Facebook it seems. Go to collect the big big data for mother NSA and father Facebook. Eh, I usually use throwaway account to get everything done and keep privacy secured. There is no free lunch in the end. I'll add the ones that don't require social networks. Humble Bundle only requests email so they could send you the link. (They are offering Devil's Advocate for free atm).Subscription/registration is optional. Overall the point is that most of the websites either request you to register to become their user, use their client (Origin EA and current On The House promo), or use social accounts to like them. PS: Now that you mention it, DHL is giving Steam keys for Pirates of Black Cove Gold edition, not sure if Knights and Merchant's is still available. Oh, I'll be adding Indie Gala ones too. (2014-10-12, 4:50:56 am)Nickster Wrote: Humble Bundle only requests email so they could send you the link. (They are offering Devil's Advocate for free atm).Subscription/registration is optional. I am fine with Humble Bundle. I have over 60 bundles and games from them so I already have an account for that. Do you have a link for "Devil's Advocate" for free on HumbleBundle? I can't find it there. https://www.humblebundle.com/mobile Here it is. I mistyped that one. It's Devil's Attorney. Note: You need to join their group (http://steamcommunity.com/groups/indiegala) on Steam to get the keys sent to you. There's also more that's being given away as free. Just login to this website with your Origin Details. http://social.bioware.com/da2/dlc_bundle/ - Just pick PC and hit Unlock. You can also do this for XBox/PS3 if you have the game. https://social.bioware.com/page/da1-dlc - Go to the bottom of the page and look for "The Stone Prisoner" with a price of 0 Bioware Points. Just hit Buy and go thru their process. This DLC is also free for XBox but not PS3. Since OP wants this thread to be a one stop 'Check here for giveaways', Maybe the title should reflect that? (2014-10-12, 7:26:55 am)Alex Wrote: Since OP wants this thread to be a one stop 'Check here for giveaways', Maybe the title should reflect that? Well to be honest, I meant it to be one single thread for the game giveaways that I find to be posted here. But, if anyone wishes to post their own giveaways, and make this thread a place for that, it is free to do so. 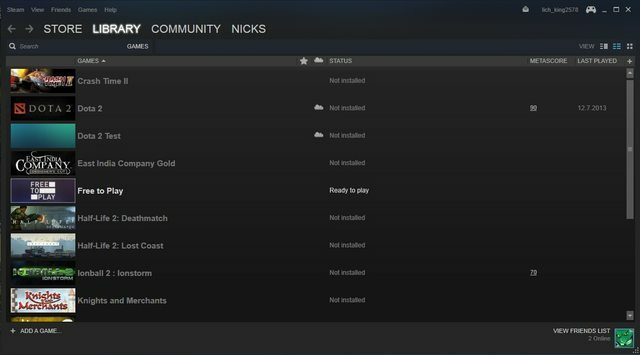 did you know that half of the activated steam games are played less than 1 hour? It happens to me a lot that I download a free game, and I'm not really interested in it. The same for big humble bundles: sometimes I buy the bundle because I'm interested in 1 or 2 games. (2014-10-13, 5:41:05 am)elijahk Wrote: did you know that half of the activated steam games are played less than 1 hour? Yeah, it happens with most stuff. I can't remember exactly, but at one time I had a dozen of games installed and played only 2-3 of them. You get bored pretty quickly. Rare are the games today that can keep you interested. Current time: 2019-04-24, 2:50:12 am Powered By MyBB, © 2002-2019 MyBB Group.